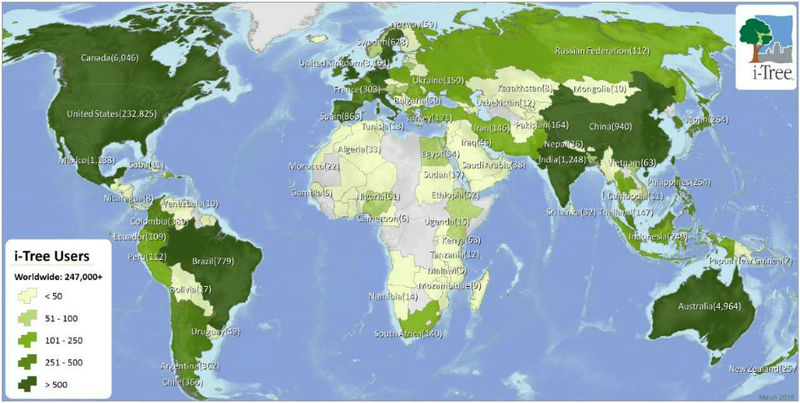 Quantifies the benefits and values of trees around the world. Aids in tree and forest management and advocacy. Shows potential risks to tree and forest health. Are based on peer-reviewed, USDA Forest Service Research in the public domain. Remove 3,100 pounds of Carbon Dioxide from the atmosphere. Reduce the emissions of 5,500 pounds of Carbon Dioxide and 30 pounds of air pollution from a power plant. Save 570 kWh of electricity and 20 MMBtu of fueling for cooling and heating. Intercept 27,000 gallons of rainfall and avoid 4,800 gallons of runoff. Filter 15 pounds of Ozone, Nitrogen Dioxide, and Sulfur Dioxide from the air we breathe. i-Tree is used around the world! We're working on a redesign for the home of i-Tree on the web! All your i-Tree links and content are still in this simplified website as we transition to a better Content Management System for the future.